The new generators purchased by JTC ... set to meet the market demand. 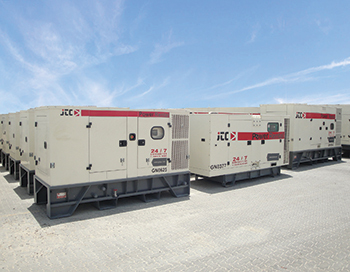 Kuwait-based Jassim Transport & Stevedoring Company (JTC) says its power rental division has procured 102 new units of Cummins diesel generators, thereby taking its total fleet strength to more than 700 units with capacities ranging from 100 kVA to 1,250 kVA. This landmark purchase is primarily aimed at meeting the market demand in Kuwait and Saudi Arabia and is part of JTC’s ongoing initiatives for maintaining a strong foothold within the power generation rental market, says the company. The new generators, which boast the noise attenuation feature, are design for installations where keeping noise to a minimum is required. Additionally, these are manufactured with the latest and highest safety standards allowing them to be utilised in critical oil and gas applications, it states. With its far-reaching logistics network, JTC can rapidly mobilise these generators to any location in the region, it adds. Commenting on the acquisition, CEO Adel Kohari says: “For around 10 years, JTC has been one of the premier suppliers of power rental solutions for Kuwait and the region, providing custom and turnkey solutions for commercial, industrial and government clients, with one of the best safety records in the industry. “These generators have been designed specifically for the harsh operating environment of the Middle East’s rental market and finished to the highest standards. This ground-breaking deal that we’ve completed reflects the rapid development of the market that we operate in,” he notes. “JTC has continuously earned the confidence of clients across all industry sectors by providing services that exceed client expectations,” he adds.